Mom of Autistic Child is Ready to Argue With Chili’s Manager—He Has A Very Surprising Reaction! 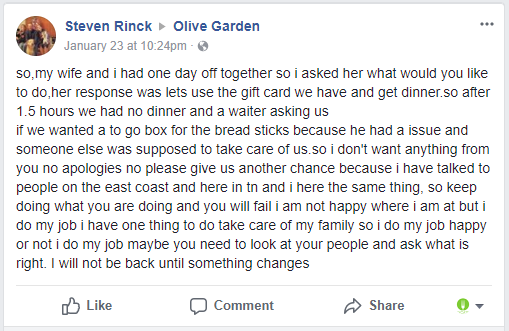 A man named Tony Posnanski is winning over the Internet with an emotional Facebook post he wrote about an encounter he had as a Chili’s manager. Though it occurred 2 years ago, Tony’s interaction with the woman and child at “Table 9″ left its mark on him forever, and it sure left an imprint on our hearts too! Did you take your own order, cook your own food, and serve it to yourself too? Suzanne: Had lunch at Great Falls, MT, restaurant today. Food and service were fine until we wanted to pay our check. We were presented with an electronic apparatus that was sitting on the table when we arrived, which I had moved out of our way. We laid our bank cards on the edge of the table, and a worker came over to teach us how to pay our check with the apparatus. Isai we would rather not. She proceeded energetically to ignore or wishes, walk us through the procedure, and ask us to tip an sign on the screen, which my friend noted was dirty. When the employee left, my friend and I agreed not to return as we were expected to wait on ourselves. Bye, Applebee’s. Why Don’t You Comp Our Food Like The Other Restaurants? Mandee: My husband and I decided to go to Red Robin for dinner last night with our 2 year old son. However, I am not sure why since the last time we went was absolutely awful, and this time was no different. It took 8 minutes for us to be greeted and to have our drink orders taken. 8! Last time it took 15 minutes so I guess that is considered progress. Pathetic progress nonetheless. When our food arrived my fries were cold and not crispy or golden at all. Disappointing! My sons meal came with a side of broccoli which ended up being brown and chewy and stringy. I always taste his food and examine it before feeding it to him. Let me start by saying that I had to stop my waiter as he walked right past us. He didn’t even ask how our meals were. When I mentioned to him that I could not feed my son what was presented to us, he looked at me like I was speaking a foreign language. He was completely useless and unapologetic, not to mention he never asked if we wanted drink refills, and when we did ask for more milk for our son, it took 10 minutes! When we go to Townhall Pub or Boston Pizza, they have NEVER hesitated to remake the order AND remove it from the bill entirely. Your staff could get an excellent lesson from these two establishments on how Customer Service should be. You should be ashamed of yourselves! The whole experience was beyond disappointing, and I can assure you that the chances of us ever coming back are slim to none. I will not be recommending this place to anybody. In fact, I will tell them to steer clear. I hope a manager reads this and takes it to heart.